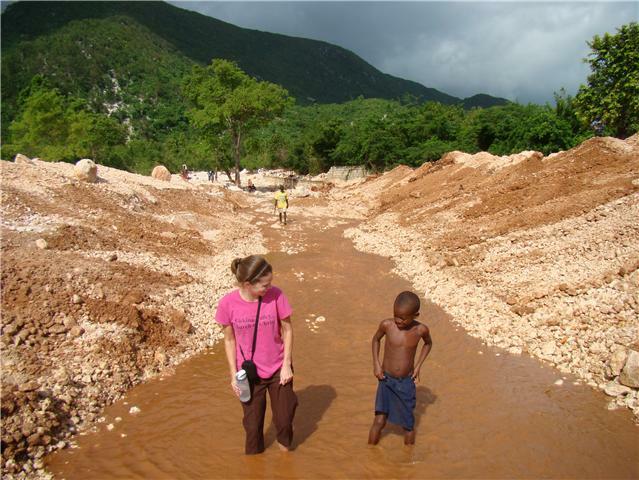 Ginny in Haiti: N ap cheche pou dlo-We are looking for water! This week we started drilling for water on the camp property in Peredo. Prayers were said in English and Creole for water to be found. They came Monday and drilled for a couple hours and came back Tuesday morning but unfortunately the drilling rig broke down. The drilling team had to return to Port-au-Prince to search for replacement parts. They are planning on returning Monday to continue drilling. Please continue to pray with us for God to give us water at this site. Right now the school kids have to bring their own water to school and when teams come to work on the camp we have to carry in our own water. The people in the community won't have to walk as far either to carry water back to their homes. The camp buildings are coming along too. The work is slow but steady. Nothing moves fast in this entire country. It is hard to believe how slow things are sometimes but when you are in the middle of it trying to accomplish something you understand why. There are no Home Depots or Lowes stores to run to when you need something. If the supplier who you get materials from is out you just have to wait until hey get more. That could be days...weeks...even months. The generator at the house I am staying at has been out for about 3 weeks now. The part can not be found needed to fix it so we have public electricity in the evenings but none otherwise. Haiti teaches one patience. But in a positive note I am posting pics of a gazebo that is almost finished and want to show you the process it took to build it. An American team that was down in February helped the Haitians measure out the plans. Everything was done by hand. From mixing and pouring the cement to cutting the wood on the top. Lots of hard work that was started in February and almost complete now. When the camp is open it will be used for a classroom. A church in St Albans, WV sent down supplies for the ladies who work in the kitchens at Haitian Christian Outreaches schools. When I met them working they were using old hospital gowns as aprons and old towels and blankets to clean up after lunch. The ladies group at Gateway Church of Christ asked for a project they could do for the people here. They sent down aprons, towels and washclothes for the workers. They sent enough for all 3 of our schools! The cooks really appreciated it. Thank you Gateway!! !